I was about to ask this question and it sort of fits with a question Mickeymouse asked me in another thread. Are you trailering your two assembled? Or maybe you towed or rafted the AIs from Lakes?? I am thinking of rafting mine and maybe using a pool noodle or two as a fender along the side of my houseboat. I have been thinking about how to tow one or maybe even two Hobie AI's for a short distance (1-2km) behind our 19 foot cruiser. We have a beach not far from where we put in in Lakes Entrance which is a great spot to base ourselves from for a day when it's busy in town. It's somewhere I could sail one AI to myself but I need to drive the boat for the rest of the family. Getting both AI's around would be even better. Has anyone set up a bridle or towed one behind a boat? Can anyone assist Mickeymouse with suggestions re docking against the house boat? As to Mickey's question - I roof racked one, trailered the other and set up at Nungurner launching using the beach cart. I'm building racks that will fit both the trailer and the off road camper which will take the components of two AI's but they'll still need to be assembled at the other end. I don't mind assembling them. I find lifting them ont and tying them on the roof rack of the 4wd (bit taller than me) more difficult than anything else in the process of a day sailing. That and the salty water & sand getting on my Patrol doesn't thrill me either. I'll post pics of my trailer racks when I get them finished. I haven't towed our boats behind another boat yet, but think it would be fine with some kind of triple bridle, so you're pulling on all three hulls. I'd take the mast down so it isn't slapping around and pull the plugs. I'd try towing them empty and with rudder up. See how one does before you try a daisy chain of two. I pulled my 2 kayaks, ( a Revo & a Sport) behind a pontoon boat last summer. I tied a rope to the front of each kayak where the front handle is. They did wonderful. They stayed straight. However I did have a person in each one with the rudder down. If you tow the AI without anyone in it I would think you should have the rudder down so it will go straight if it gets on a wake. Guess you just need to try it. Everything before 60 is just a rehearsal! I find lifting them ont and tying them on the roof rack of the 4wd (bit taller than me) more difficult than anything else in the process of a day sailing. That and the salty water & sand getting on my Patrol doesn't thrill me either. You should speak to Pirate about getting his AI onto a roofrack - he seems to have it down to a fine art. I carry my AI and another kayak on the roofrack using a Rhino J rack. Also, I have taken to inverting my AI after use to drain the the mast hole thingy, then giving it a quick wipe over with a towel prior to racking it - that seems to take care of the salt water and sand on the car. I have seen Pirates setup. My problem is that the ARB roofrack on mine and the 2" lift in the 4wd suspension put the height of the rack at nearly full arm stretch. I usually put mine on with the deck facing up so as not to have to lift the aka bars over the roofrack - the extra 2" lift required is near impossible. Then I turn it over on the roof. I like the idea of wiping it down but ultimately I think roof racking will be the minority of trips - purely for fishing locations I can't get a trailer into. The rest of the time I think I'll trailer it. I wondered if towing it behind the boat with the dagger board in rather than the rudder down would be a better alternative. Obviously you would only tow them slowly. I thought the rudder might develop a mind of it's own. I wouldn't try the daggerboard because it is offset, and because if the boat starts to stray off course, the lift created by the daggerboard could cause it to continue and get worse. If you leave the rudder down for towing, make sure you find a way to secure it straight ahead. If you don't, side loads during towing will likely turn it. While I haven't towed the AI behind another boat yet, I have towed other small sailboats. In preparation for a daytrip that never materialized, my brother and I sat on his boat (31ft sailboat) and pondered the best way to tow two AI's. Not sure about daggerboard up or down. My first inclination is board in and rotated back close to the hull, but that's before trying. Same for amas in or out, but I'd say out as I think it would offer less drag. I would definitely keep the rudder up though. The rudder will move as waves and wind push the boat around. A trick I learned many years ago (Chapman's Seamanship & Small Boat Handling) is to tie a fairly heavy line to the stern of the boat being towed. Let the line drag in the water so it acts as a sea anchor. If traffic or local conditions make dragging much of a line too much of a hazard, then shorten the line and tie a towel, cushion, or similar item to the end. The drag will keep the tow lined up behind the lead vessel. One other thing, if towing two boats behind you, DO NOT tie one tow to the other. Tie one long line to the lead vessel and then tie each tow to that line. If you tie the bow of the rear tow to the stern of the forward one, you're putting the entire strain of two boats being towed on the connection point at the bow of the forward one. It might not be strong enough for that. When we pondered how to bring two AIs along for the daytrip, I had planned to run the main towline so that it passes through a shackle on the bow of the first AI, under both aka crossbars, and out past the stern to the second AI. Passing through the bow shackle will keep the bow pointed where you want to go, without placing the tow strain that potentially weak point. Do pretty much the same thing on the second AI, letting the tow line drag behind as the sea anchor. Use a short length of line to tie each AI off to loops tied in the main tow line. The typical tow point on a small sailboat is to fasten to the mast, as that's usually the strongest point on the boat. Pass the main tow line through a shackle on the stern padeye of each boat to keep the sterns lined up with the tow line, which should keep everything in a nice straight line while underway. 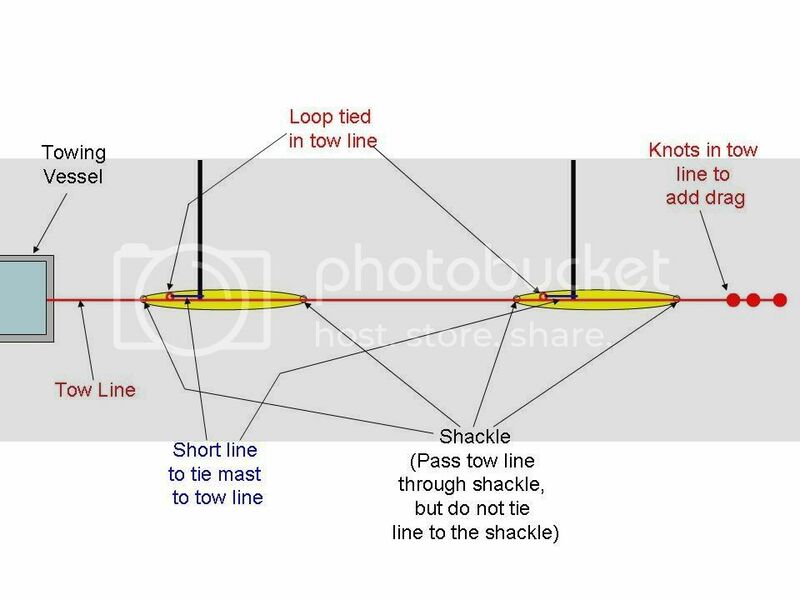 Chapman's and other references are out there that can provide more detailed information about towing and other points of seamanship. This ought to be a good start though. I would go rudder and dagger up. You do not want the boat to track off to one side or the other. Rather they should be able to slide sideways a bit. Slow speed only. Thanks to Jim L for the post above that one, I'll have to try and draw a diagram off that description to see if I have it right and post it back here. My houseboat only travels slowly anyhow - about the same speed as the AI when peddaling vigorously. I have towed a couple of amphibious bikes behind it - all over the Hawkesbury, Murray etc without any problems. However they (or the AI) can get in the way and make life difficult when you need to reverse or maneuver around other boats. Probably not an issue in a Haines or most other watercraft, but quite difficult in my houseboat because I have no access to the sides. I am going to try rafting it to the side the next time I have them both on the water. Hey, we never know... have seen a lot over the years. I would also be concerned about the loads and possibly snapping load against the bow handle eye. This is not intended as a towing eye and could damage the hardware it is mounted to in the hull and or distort the hull material. Not sure of the best answer there. Thanks for the kudos, but I can't claim credit for basic seamanship. I learned most of that from reading my copy of Chapman's Seamanship & Small Boat Handling, (aka The Sailor's Bible) over 35 years ago. Read it cover to cover several times when I was a kid. Wish I had that kind of time these days. Anyway, I'll also make no claims to be an artist, but I managed to bang this out in PowerPoint. I left off the amas to simplify the diagram. 1. Do not tie the tow line to the bow or stern shackle. Run it through the shackle so that the tension in the line keeps the bow and stern lined up with the direction of travel. 2. Rudder up so that it doesn't try to steer the boat around. 3. The line between the towing vessel and the first tow should be long enough so that the tow is riding at, or just behind the crest of the first or second wave created by the wake of the towing vessel. Too short and the tow will want to fall forward off the wave, possibly getting swamped by the wake wave, or even hitting the stern of the towing vessel. Too long and you are always pulling the tow up or into the backside of that wave. 4. Don't necessarily tie the short line to the mast. Take several wraps around the base of the mast and then tie the line to something convenient, such as the aka crossbar. That way the mast takes the load of the towing, but the knot is out where it's easy to access and untie. Do a google search on towing a dinghy. There are a number of useful articles out there on the subject. Picture looks good, but I would attach the short rope to the Aka support instead of the mast. The Aka support should be the strongest part of an AI.